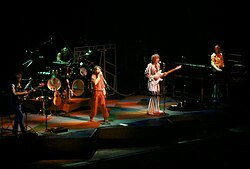 Yes are a progressive rock band that formed in London, England in 1968 that is among the most influential progressive bands of all time. The band has received wide critical praise for their work. Their best known songs include "Owner of a Lonely Heart", "Roundabout" and "I've Seen All Good People". This page was last changed on 22 June 2018, at 06:20.